Much has changed in the year since I wrote an article looking back on Europe’s refugee crisis in 2015 . The article highlighted record numbers of refugees, mainly from Syria, unevenly distributed across a continent struggling to cope. If 2015 was the year of crisis, then 2016 has been the year contradictions. About 360,000 refugees arrived in Europe in 2016, almost two-thirds fewer than the one million in 2015. One reason is strengthened border controls across Central Europe and the Western Balkans – Albania, Austria, Bulgaria, Croatia, Hungary, Macedonia and Slovenia have all erected fences in response to the 2015 influx. A second reason is the controversial deal between Turkey and the European Union , permitting Greece to return refugees to Turkey, incentivizing Turkey to stop refugees leaving for Greece, and in exchange resettling refugees from Turkey directly to Europe. And yet by the end of October, the number of refugees who had drowned in the Mediterranean in 2016 had already surpassed the 3,771 reported drowned in 2015. Before getting too distracted by statistics, take a moment to reflect that about 4,000 people have drowned trying to get to safety in Europe over the past 12 months. Here is a good example of the law of unintended consequences. The explanation for the discrepancy between the sharp reduction in the number of refugees reaching Europe and the rise in those drowning is that as legal routes for entry close down, illegal routes open up to replace them. These illegal routes are dominated by smugglers who exploit refugees and pack them into unseaworthy vessels. It also seems likely that some of those who once would have crossed into Europe from Turkey to Greece across the relatively benign Aegean Sea route are now being diverted into North Africa and across the much more perilous Mediterranean route. Europe’s polices have stemmed the flows, but not the bloodshed. Compared with 2015, there has also been far less media and public attention to refugees in Europe. One reason, of course, is the reduction in numbers; although this has not been evenly spread – Germany continued to receive the largest numbers, whereas they dropped significantly in Austria, Hungary and Sweden, but rose in Italy. Another reason is compassion fatigue. Certainly as many infants have drowned in the Mediterranean in 2016 as in 2015, but there has been no public outcry comparable to that in response to the death of Alan Kurdi in September 2015 . But less attention in Europe has not resulted in more attention to other parts of the world, where the real refugee crisis is unfolding. 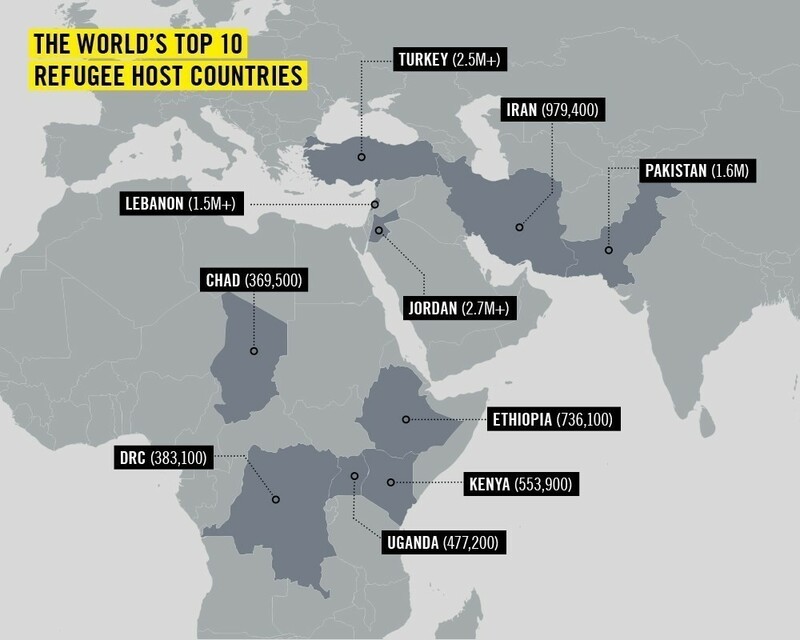 Over 80% of the world’s refugees are in poorer countries; and there are far more Syrians in Jordan, Lebanon or Turkey than have arrived in the whole of Europe in 2016. Increasing numbers of refugees are fleeing Eritrea and South Sudan. During 2016 almost half a million Afghan refugees were forced to return home from Pakistan. In other words, when it comes to refugees, 2016 saw a return to the maxim: out of sight, out of mind. If the rhetoric on refugees has dialled down among the public and the media in 2016, it certainly has not among some politicians. European border fences have been built on the foundations of anti-immigration scare-mongering. Xenophobia was instrumentalized both during the Brexit and the US presidential campaigns. At the same time, the international community and private sector have stepped up over the past year. On 22 September, the UN General Assembly adopted the New York Declaration for Refugees and Migrants, and committed to developing a more equitable means to share the burden and responsibility for refugees by 2018. The private sector, led by Hikmet Ursek of Western Union and Hamdi Ulukaya of Chobani , has invested significantly in solutions for refugees, ranging from social investment and philanthropy, through advocacy and public policy engagement, to partnerships and collective action. In the absence of political leadership during 2016, responsive and responsible leadership has emerged elsewhere. If 2015 was the year of crisis for refugees, and 2016 the year of contradictions, then 2017 needs to be the year of certainty. Refugees need to be certain of their right to seek asylum in safety. The international community needs to be certain about where the real crisis is. World leaders need to be certain that they will follow through on their pledges to the New York Declaration. The private sector needs to be certain that it will continue to pledge business action on refugees. The World Economic Forum Annual Meeting in Davos this month has a very significant focus on refugees and the future of humanitarian response. Where better to cement certainty for the year ahead.